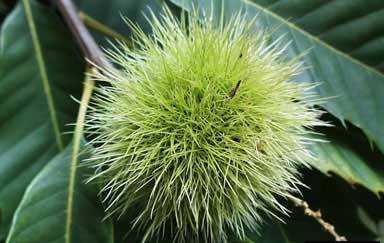 American chestnut bur. Photo by Paul Wray, courtesy of Bugwood.org. American chestnut thrived in eastern North American forests for thousands of years, but in the 20th century, an exotic fungus almost eliminated the species. To date, chestnut restoration has mostly meant breeding blight-resistant trees. Now, thanks to a collaboration between the U.S. Forest Service, The American Chestnut Foundation, and institutions like the University of Tennessee Tree Improvement Program, those blight-resistant trees are on the horizon, and scientists are developing silvicultural strategies to restore them to forests across their former range. Since only limited numbers of presumed blight-resistant trees are available, Clark and her colleagues used pure American chestnut seedlings for the silvicultural study that was recently published in the journal Forests. Like all pure American chestnuts, the seedlings are susceptible to blight, but before becoming infected can inform the researchers about how chestnut seedlings respond to different light conditions. The researchers created open, sunny conditions on the forest floor with a two-age shelterwood harvest, and obtained low light conditions by removing trees in the middle canopy layer. The study sites were located along forested slopes in the Bent Creek Experimental Forest, which is located in the Southern Appalachian Mountains. For 5 years, researchers monitored seedling survival, growth and blight development. In both sites, approximately 67 percent of trees survived, and both sites had similar levels of blight occurrence. However, the two-age shelterwood treatment gave seedlings a clear advantage in growth. “Seedlings grown in the shelterwood site were significantly taller and bigger,” says Clark. Researchers also looked at the effects of seedling size, and found that the shelterwood site could have been even more productive if only the largest seedlings had been planted. Keeping the young trees free to grow by controlling competing vegetation on shelterwood sites may also have helped the seedlings. “If chestnut seedlings are planted in treatments similar to the midstory-removal in this study, the trees will take 5 years to grow as tall as seedlings in a two-age shelterwood harvest will grow in just 3 years,” says Clark. The findings are timely, as the shelterwood regeneration treatment is part of the Forest Services national management plans for the southeastern United States.